In my “Follow the money” post yesterday I mentioned Christian charities and how money might temper them from speaking freely. Now, let me be clear I have no evidence that the Obama administration warned Franklin Graham to temper his words or tried to alter how much money Graham’s organization, Samaritan’s Purse, receives, but just knowing millions of dollars in federal-funding go to Graham’s private charity shows this conflict of interest in being free and unbiased. I admire the work Franklin Graham’s charity does, so don’t interpret this the wrong way. 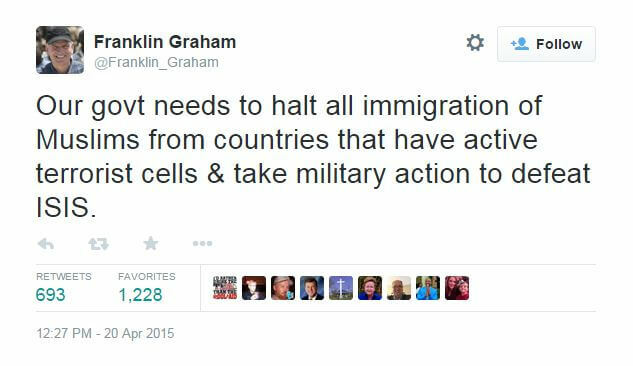 In the aftermath of this Garland, TX terrorist attack, Graham spoke out in a way so cautiously compared to his previous comments on radical Islam, that the contrast struck me as odd. “Evangelist Rev. Franklin Graham on Wednesday said that while he supports Americans’ right to free speech, the attendees at the Muhammad cartoon contest near Dallas “were wrong” to mock Muslims. The Huffington Post and Slate are two progressive/left-wing publications and the Sunlight Foundation claims to be non-partisan – so, two out of three of her previous jobs were working for left-wing publications. Might she be a progressive/liberal? Truly, this is how you have to go through news in Ameica, both on the right and the left – you can’t trust our mainstream media at all and most of them are left-leaning despite proclaiming otherwise and the right-leaning and outright right-wing ones invest more time at slanting stories toward their political viewpoint than they do just looking for the facts and the truth. Wow, she used to work not only for this TPM news site, but she even worked for Al Jazeera. This same process can be done for the right-wing news organizations and I am even applying this to Chrisitan charities now – agendas and money – we all need to seek the truth, because partisan politics, big money polluting everything from within our political system and foreign money being spent to create chaos in America too are tearing America apart. A free press was supposed to protect us from the tyranny of government and now it’s truly just another tool of political factions. Few “journalists” bother to do much fact-checking or looking for agendas. I’m just sick of the political factions in America trampling on The Constitution and having to go through this much effort to find the TRUTH from those who proclaim they are our free and unbiased press.